Description: The Grand Forks Local waiting to get back into the yard after a day of work. Description: BNSF 3609 and matching caboose roll north and back into the yard. Description: BNSF Yard Limits - Beardstown Sub. Description: City Job returns west after working in E. Grand Forks. Description: Switch work at the dock area. Description: These SWs quickly shove a set of grain cars through 28th street yard. Description: A dreary day finds quite the surprise. 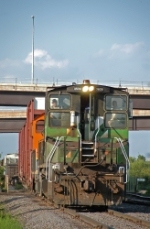 An SW1000 on the pullout job, which usually has one of two SD40-2's, the 6332 or the 7821. It sounded quite nice!